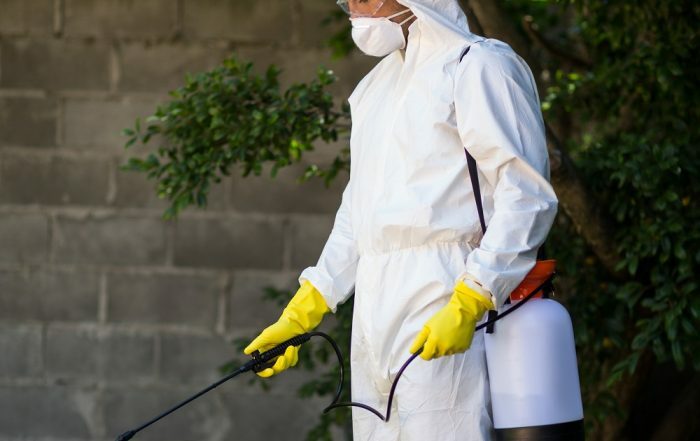 Glyphosate, commonly known by its original trade name Roundup (manufactured by Monsanto), is the world’s most widely used herbicide (weedkiller). Glyphosate-based herbicides are manufactured by many companies in many countries. Glyphosate is used on many crops to control weeds, including about 80% of genetically modified (GM) crops. Seeds are modified to be resistant to glyphosate so that when the herbicide is used it kills only the weeds around the crops. It is also sprayed on many crops, including cereals, such as wheat and oats, as a pre-harvest desiccant. This encourages the crops to dry quickly and evenly, allowing for earlier harvesting. In addition, it is used by land owners, such as councils, to control weeds in our towns and cities. It is used in our parks, playgrounds, schools and on our pavements and verges. It is also readily available in many supermarkets and garden centres as an easy tool for gardeners at home and on allotments. Glyphosate is found as a residue on many of the food products we eat. It has also been found in water, wine and beer. Testing has revealed that glyphosate is present in people’s urine in Europe, and in urine and breast milk in the USA. Read more about pesticides in our food here. In 2015, the International Agency for Research on Cancer (IARC) labelled glyphosate as “probably carcinogenic”. 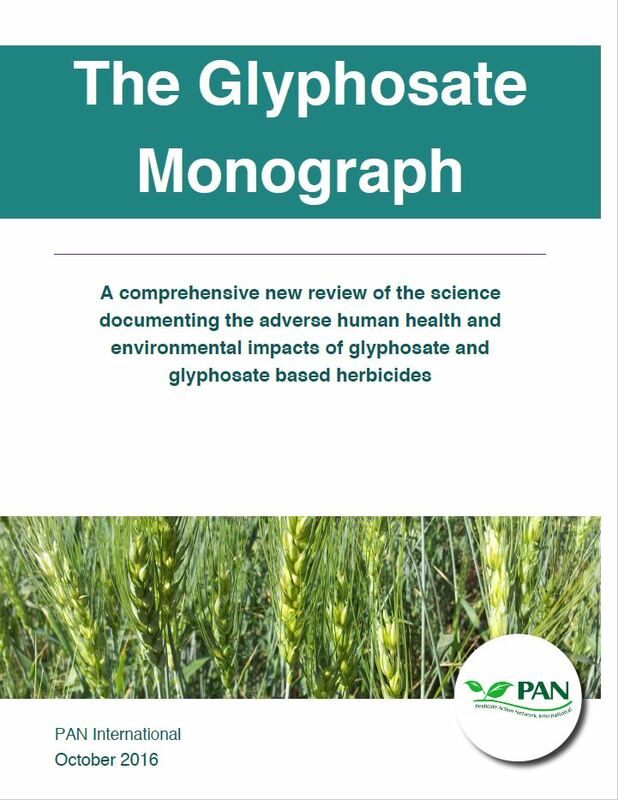 Independent scientific studies have also begun to reveal numerous acute and chronic effects of glyphosate-based herbicides. In addition, the ingredients (adjuvants) added to glyphosate products may be toxic. Many of these chemicals are trade secrets and we rely on the manufacturers to ensure the products have been tested to be safe. Studies have found that glyphosate-based herbicides can interfere with various organs and biochemical pathways in mammals. Genotoxicity and endocrine disruption also lead to chronic health and developmental effects. It causes imbalances in gut bacteria and some studies have found that glyphosate appears to accumulate in human cells. At low concentrations it damages liver, kidney and skin cells and long term effects include cancer, infertility, pregnancy problems, birth defects and respiratory diseases. Read more about the effects of pesticides on our health here. Glyphosate has direct and indirect effects on the environment. Indirect impacts on birds and other animals occur due to the wiping out of weeds and wild flowers, destroying habitats and food supplies. Glyphosate is water soluble and has had significant effects on species that underpin the entire aquatic food chain with amphibians being particularly vulnerable. 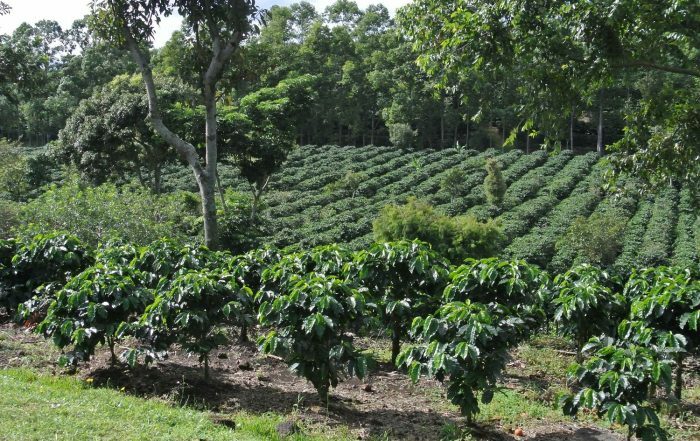 It upsets the balance of microbial communities in soil, increasing the numbers of some microorganisms and decreasing others, impacting on soil fertility. It has caused an upsurge in some crop diseases in no-till agriculture by stimulating the growth of a number of fungal pathogens. It also binds micro-nutrients in the soil causing deficiencies in plants. 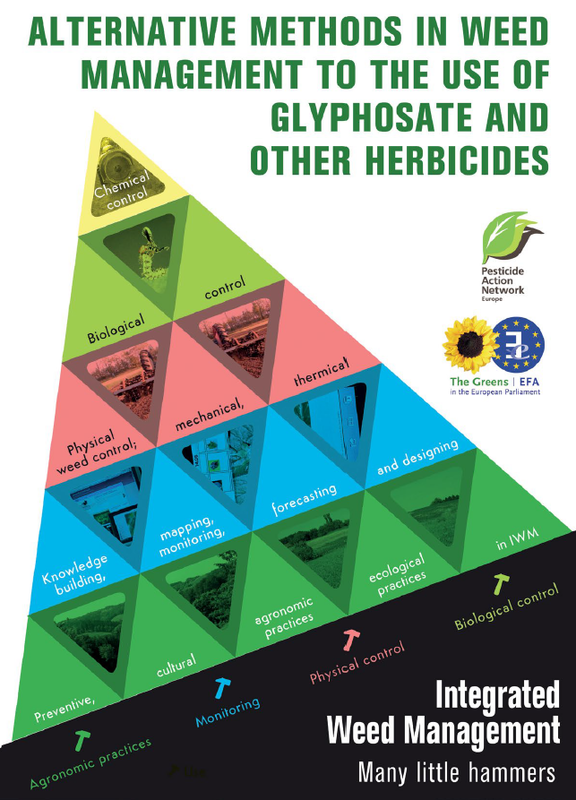 Glyphosate has also been found to have adverse effects on earthworms, beneficial insects and bees. Read more about the effects of pesticides on our environment here. 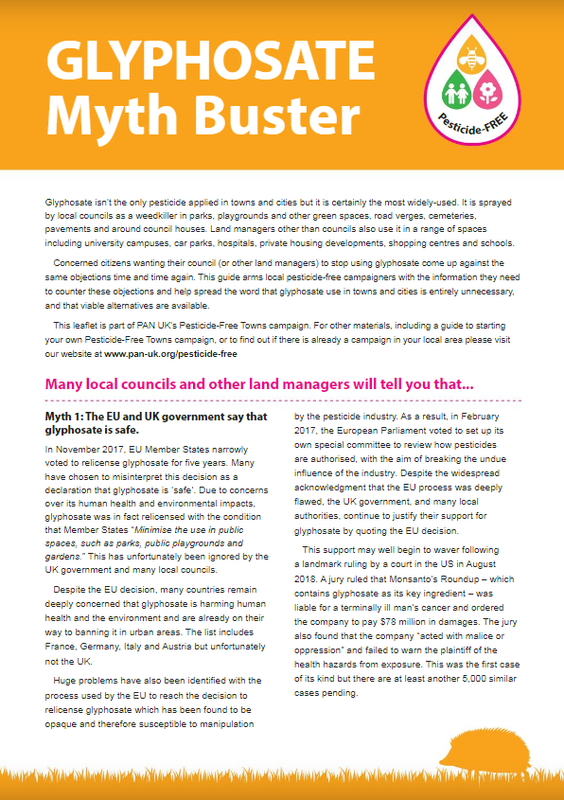 The immediate withdrawal of glyphosate from sale to the public – some responsible retailers like Waitrose have already stopped selling glyphosate, and others should now follow. 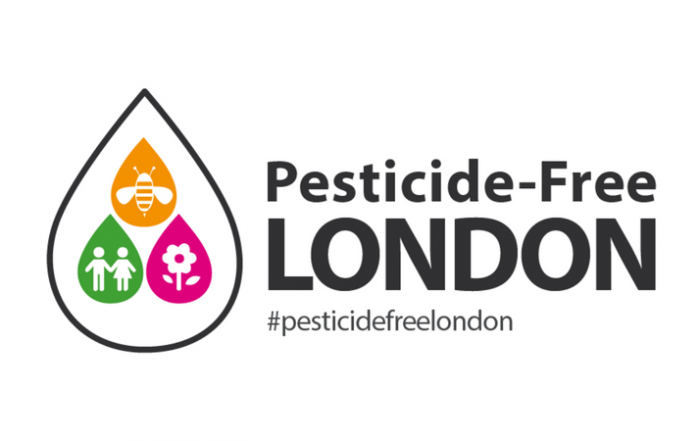 An immediate end to the use of glyphosate in public spaces in our towns and cities – find out more about our Pesticide-Free Towns campaign. 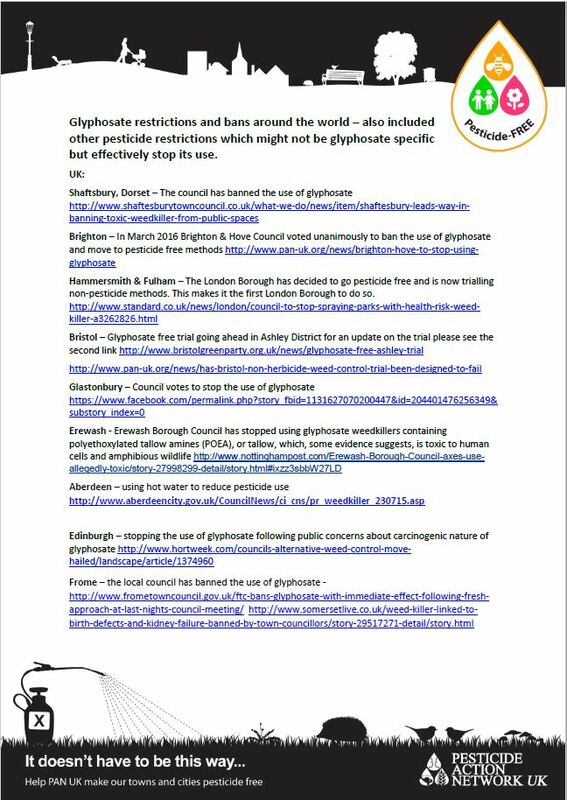 An immediate end to the use of glyphosate for pre-harvest desiccation – it leads to higher levels of glyphosate residues in our food. Rapid phase-out of glyphosate in agriculture and support to help farmers adopt safer approaches to managing weeds.